Are you sick and tired of dealing with acne for years and nothing seems to help? Do you feel like there is something more to all the skin problems than just hormones imbalance and clogged pores? If the answer is ‘YES’, this post is for you. Being a victim of acne for quite a long time until I turned 24, I have never thought that skin problems are the way your bodies use to tell us that something is wrong from the inside and that they needed to be fixed from the inside as well. FOREHEAD: If you are suffering from a lot of acne on your forehead, you probably also experience digestive problems such as bloating and fatigue. You probably also don’t have a very healthy diet. Avoid fast food and eating out too much. I know it’s hard, especially when you are still in school and fast food is pretty much all the options you have on campus but it is all going to be worth it. Stop stressing out! Stressing out is like walking around with an umbrella hoping it won’t rain. Stress will have a major impact on your skin and guess what, you will end up stressing more because of all the pimples on your forehead. You also want to reduce your sugar consumption. Sugar has been proved to have many negative impact on our health including acne. Switch that can of coke for a bottle of water! If you are prone to get acne on your forehead, I also recommend you not to have hair styles that have bangs. Having bangs around the forehead can worsen the problems because your hair. TEMPLE AND EYEBROWS: Have you been partying a bit too hard or having a bit too many french fries? Having pimples around this area is a sign that your lifestyle needs to change. RIGHT & LEFT CHEEKS: You are probably really stressed out right now. Don’t. Whatever problems you have in life will soon be resolved. Please focus on the positivity. Also, if you smoke, you are not helping your body and your skin to recover from all the inflammation that your lifestyle is causing. 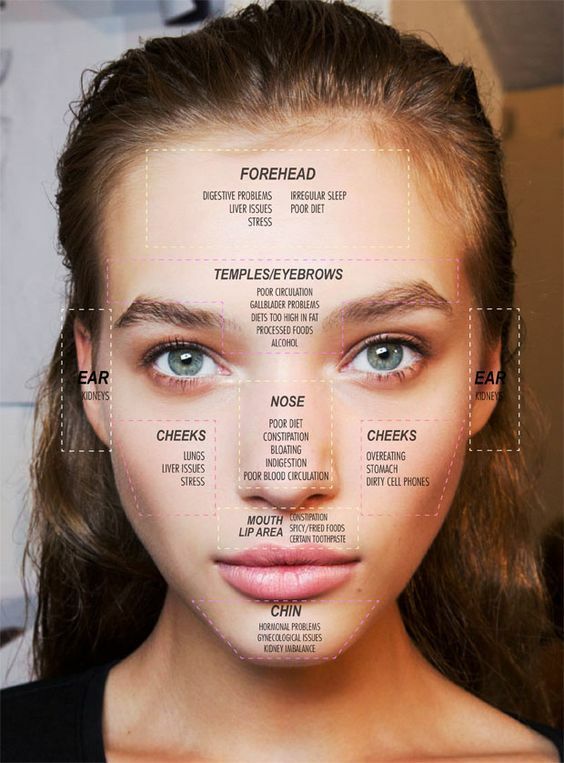 MOUTH & LIPS AREA: I rarely see anyone with acne problems around this area unless it’s a cosmetic allergic reaction or if your lips products are not suitable for your skin. If acne is common for you around this area, you need to cool down on those spicy and fried food. I have recently broken out on my chin for the first time ever I think and I have been so stressed lately so I am seeing the link! I need a holiday! Very informative post! I often have breakouts on my chin, sometimes near my eyebrows. Too much stress from work and yeah, have to stop going to fast foods! Great post!